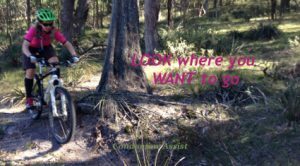 Discovering mountain biking as life’s ultimate parallel universe was an unexpected bonus to the fresh air, exercise and family time that initially motivated me to jump on my bike and get into the great Australian bush. Over the past few years I’ve managed to improve my riding skills somewhat, but what I’ve truly learned is much, much bigger than how to keep the rubber side down! Here I would like to share with you some of the lessons I’ve learned about life through mountain biking. When you focus your attention on something right in front of you, it immediately becomes an obstacle between yourself and your end goal. On a mountain bike this might be a rock, tree root, or a deep rut in the track. You can be guaranteed as soon as you fix your attention on it, well ….. that’s where you’ll go! The trick is to acknowledge the presence of the obstacle but stay most attentive to the line you actually want to take. It’s the same in life generally. It’s so easy to get caught up in the distractions around us, the bumps and hiccups in our day, and to lose sight of our end goal. It’s so easy to give up when those unexpected obstacles get in our way. But this lesson is a keeper! Keep your eyes looking where you WANT to go. So much of mountain biking seems counter-intuitive to me. My inner child has a strong survival instinct and tells me loud and clear that if something looks dangerous, I should get as far away from it as I can. And so it happens that learning various MTB skills such as cornering and negotiating steep descents has been a big challenge for me. Leaning into the curve and getting closer to the (very hard rocky) ground that’s whizzing past just doesn’t seem to make sense. Yet it works time and time again! Acknowledging and then leaning into other things we fear in life can be likewise empowering – going to learn-to-swim classes as an adult to deal with a fear of water, accepting a work role that will extend your skills beyond your self-belief, or even going shopping alone. We all have fears and we all have the opportunity of experiencing the sensation of empowerment that comes when we confront and lean into them instead of running away from them. I’m pretty much a slow-poke on my MTB. At least I am when it comes to going downhill or over the technical terrain. I’ve been very hard on myself at times for not being able to keep up with others, especially when I’ve practised hard and haven’t seen any significant improvement. But do you know what I’ve learned? ‘Fast’ is not superior to ‘not the fastest’ (unless you’re in serious racemode of course!). But really, when it comes down to it, what actually makes ‘fast’ such a desirable state of being in our society? Giving myself permission to go at my own pace whether it’s on my bike, swimming at the pool, or working on a project, seems to help me focus on moment-to-moment enjoyment which truly enriches my life. Going slow, or slower, or at my own pace, does not equate with failure or being deficient in anyway. Slowing down other parts of my life helps me to meaningfully engage with those things and those people that matter the most to me. 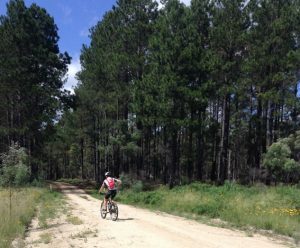 All-out fast paced riding up hills, down rocky terrain, winding through bush trails, dodging tree roots, negotiating loose rocks, squeezing between trees – it’s exhausting work for the body and mind! There’s always that one person, you know them …… the eternal chatterbox ….. who seems to be able to keep nattering on endlessly and cheerfully and looks surprised when you don’t answer because OH MY GOSH ….. my heart rate has been sitting on 172 for the past 10 minutes, my heart feels like it’s going to burst out of my chest, and my head is so light it feels like it’s going to float away! I need a break! And even if the rest of you don’t, I’ve learnt from past experience to speak up and express my needs otherwise I’m likely to run out of fuel before we get to the end. Same in life – anything and anyone runs smoother and more efficiently given time to rest and collect. Listen to your mind and body – do what you need to in order to get it done. It’s not a weakness to have a break, and in fact, others will probably be secretly very thankful! As a child and younger adult, there were many things that seemed to come naturally to me. Anything that I couldn’t do pretty well the first time I tried it, well … basically I didn’t bother too much about it again. I never really learned much about persistence when the going got tough! I don’t recall anyone teaching me to ride a bike. It’s one of those things that seemed to come naturally. However, MTB is vastly different to riding on a road or concrete path or even your average back yard. The techniques and skills required to safely negotiate the rough and often narrow terrain of single track have often seemed insurmountable to me, the middle-aged female trying to prove her worth. So, with humility, I’ve learnt that I can practise and persist at practising, and then practise some more. And eventually, gradually I learn new skills. I figure there’s a heck of a lot of brain-rewiring going on up there as I try, retry and try again, day after day after day, and then still needing lots more practice to get it right. In my work life, this lesson of persisting and practising has enabled me to implement some much needed changes that would otherwise have never happened. 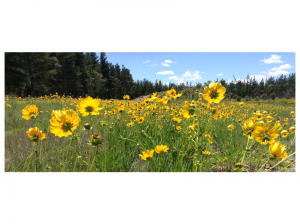 These are my first life lessons learned through mountain biking, but they are not my last. I continue to learn and grow as a rider and as a human being. Watch out for my upcoming article “Another 5 Things I’ve Learned About Life Through Mountain Biking”.